So what is a Virtual Reality Tour? Once you have booked the tour, your tour professional guide will tell you when and where to meet – either in front of the historical monument or at a pickup point arranged previously with your tour guide. You then get the chance to step into the virtual world and witness the past, in immersive 360º stereoscope, as you tour guide highlights and explains what you are seeing. 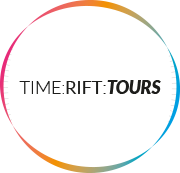 We provide all the VR Headsets and the tour guide controls the tour from their tablet or phone, guiding you through the VR world as a group. As long as you are dressed for the weather, you are all set! Hotel pickups, transport requirements etc.